Mitochondria are dynamic organelles capable of decoding intracellular signals into markedly different actions, from energy production to cell death, using calcium ions as messengers. Mitochondrial calcium-signaling pathways are indeed considered prime drug targets, as their positive or negative regulation can determine cell fate in models of ischemia-reperfusion injury, neurodegeneration, cardiomyopathies, and metabolic disorders. Despite tremendous progress in compiling a nearly complete list of human mitochondrial proteins, the tool kit for sensing, modulating, and propagating intracellular calcium signaling cascades remains largely unknown. We develop computational and experimental strategies to predict, test and reverse the effects of genetic and chemical perturbations on mitochondrial calcium signaling to spotlight key checkpoints that could be targeted pharmacologically. Our long-term goal is to achieve a systems-level understanding of mitochondrial calcium homeostasis and to assess its role in metabolic disorders. 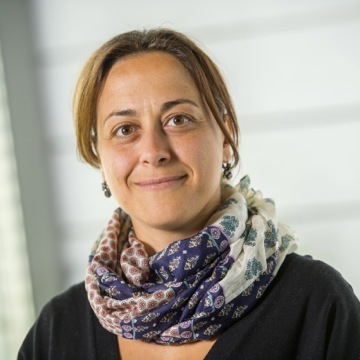 Fabiana Perocchi is currently an Emmy Noether Research Group Leader in Functional Genomics at the Helmholtz Center of Munich. She is also a Junior Group Leader of the Bavarian Research Network for Molecular Biosystems at the Gene Center of the Ludwig-Maximilians University. Dr Perocchi trained in Genomics and Molecular Biology as a graduate student with Lars Steinmetz at the EMBL- European Molecular Biology Laboratory. In 2008 she moved to Boston, in the department of Systems Biology at Harvard Medical School and Massachusetts General Hospital. During her postdoctoral studies she discovered and defined the molecular components involved in mitochondrial calcium transport. Ongoing research studies in her laboratory seek to lay the foundation for a systems-level understanding of Ca2+-dependent signal transduction cascades in human mitochondria to advance basic and disease biology. Dr Perocchi has received a number of awards and grants, including the Martin Prize from the Massachusetts General Hospital and the e:Med Systems Medicine award from the German Federal Ministry of Education and Research.